Dutch pancakes are a different variety than your typical Sunday morning American-style pancakes, French crêpes, South Indian dosa or any other pancakes you may have been sampled around the globe. Dutch pancakes are often savory and served with bacon, ham, Gouda cheese, or a combination of two. They are also sometimes served with sweet fruits like pineapples, bananas or apples. What truly sets Dutch pancakes apart from our maple syrup laden American pancakes is the time they are served. More often a dinner dish, most pancake restaurants in Amsterdam do not even open until well after breakfast time! However, if you've ever had breakfast for dinner, you will thoroughly enjoy eating these salty or sweet but always fluffy little clouds at any time of the day or night. Pancakes and their smaller, but no less tasty cousins, poffertjes, are a popular Dutch meal that tourists visiting the Netherlands should sample at least once. If you time things perfectly, depending on where you live, visit one of the best pancake restaurants in Amsterdam right when your flight arrives in the morning, and it will be breakfast time at home. The quality is in the details at PANCAKES, who source their flour from an authentic Dutch windmill in nearby Hoofddorp. PANCAKES doesn't only offer the Dutch variety but also features international pancakes like Russian blini, French clafoutis, and Korean pajeon. It's one of the rare pancake houses open for breakfast, so if you enjoy eating an international breakfast, make this your first stop. As another incentive, I Amsterdam cardholders receive a 25% discount before 1 p.m. Phenomenally tiny but very cozy, Upstairs Pannekoekenhuis is traditional Dutch food and atmosphere at its best. 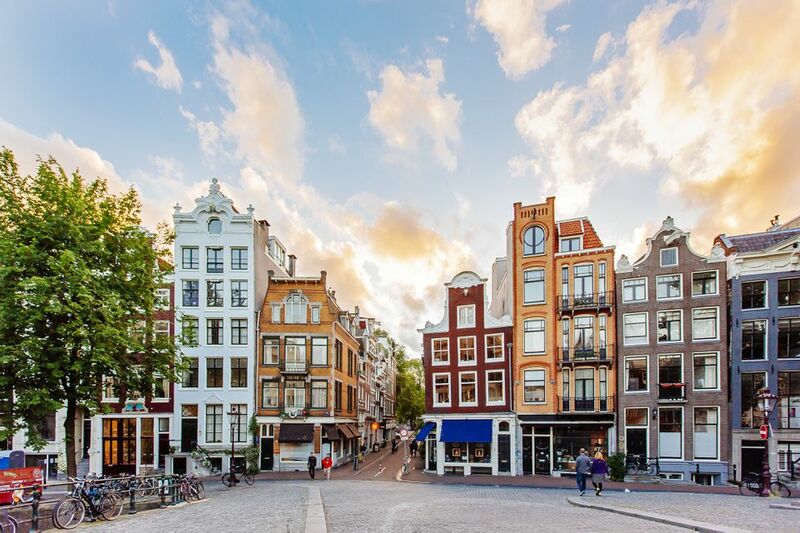 True to its name, visitors have to climb a precipitously steep staircase--typical of old Dutch row houses--for a taste of some of the best sweet and savory pancakes in town. It's not a surprise that this was also the pancake house featured on Anthony Bourdain's The Layover. And don't worry, there's no typo: the spelling pannekoeken (instead of pannenkoeken) predates the Dutch spelling reform that added the extra n, which is silent. The Pancake Bakery is the most tourist-heavy on the list, but nevertheless, a solid favorite for their extensive menu of truly massive pancakes, bite-sized poffertjes and wide array of dishes meant for kids. It also has the most variety of non-pancake dishes for the pancake averse, from soups and salads to omelets and sandwiches. Bonus: It's just a stone's throw from the Anne Frank Huis, which partly explains its popularity, but it is still a solid choice for a hearty meal. Described as having the best pancakes in Amsterdam (and possibly the world), according to some happy guest reviews on TripAdvisor, The Happy Pig Pancake Shop is a cozy little restaurant and coffee bar located in the historic center of Amsterdam. The restaurant space is beautifully decorated but also incredibly tiny, so it is sometimes very difficult to find a seat. If you don't mind the wait (or taking your items to go), the menu offers classic Dutch pancakes made with organic ingredients, and a variety of both sweet and salty toppings rolled into the pancakes and sliced. The Happy Pig also serves gluten-free pancakes, Belgian waffles, specialty coffee drinks, teas, sodas, milkshakes, and decadent organic ice cream sundaes. This pancake house–obviously from the name–isn't Dutch at all. However, it does deserve an honorable mention as a favorite pancake house in Amsterdam. Japanese Pancake World specializes in the Osaka specialty of okonomiyaki: a pancake made of wheat and yam flour batter with shredded cabbage mixed in, then topped with any number of extras. The pancakes are cross-hatched with a Worcestershire-like sauce and Japanese mayonnaise right before serving and are incredibly delicious. Beware that the restaurant is often closed for extended periods of time without warning. But, if you are able to visit this non-traditional pancake house, it is well worth the wait.